Here in the US, some retired miners might recall a day when our coal mining fatalities were up in the quadruple digits. We experienced more than one thousand annual coal mining fatalities through 1947. It wasn’t until after 1985 that fatalities dropped consistently from triple to double digits. Our worst disaster occurred in 1907, when 362 boys and men died in West Virginia’s Monongah Mine disaster after an underground explosion. In fact, the plethora of mining disasters with hundreds of fatalities were a backdrop leading to the establishment of better worker protections, including a workers compensation system. One can only hope the public will call for increasing safety and reforms in China mines. For more on this story, we went to the best and most knowledgeable mining media source we know and it did not disappoint: Ken Ward’s Coal Tattoo has the latest coverage of the China tragedy, including an update which notes that warnings were ignored before mine flood. Ken reports on mining for the Charlotte Gazette. He and the people of West Virginia know quite a bit about mine disasters. Earlier this year, Ken reported that the nation experienced a record low in mining deaths last year – 34 – but he asks if that is enough. Good question. A little over a week ago, Ward reported that fewer than 1 in 10 U.S. mines have added improved communications and tracking equipment that could help miners escape an explosion or fire – a requirement after the MINER Act, a law that was prompted by a series of mining fatalities in 2006, including the Sago mine disaster. Our sympathy goes out to the families of the China miners, who are suffering through a terrible vigil, the way so many other miners’ families have suffered. We can only hope that tragedy will serve as a catalyst to better safety advancements in China. And despite the progress we’ve made here in the U.S. over the years, we see by the recent report about the lackadaisical measures taken to protect our own miners, our memories are short. Utah Workers Compensation Fund Safety Topics. More than 60 safety topics, many in both English and Spanish, are available in PDFs. Ohio Bureau of Workers Compensation Safety Publications. More than 40 guides and manuals are available in PDFs. Washington State Department of Labor and Industries has a variety of posters and safety guides available in PDFs. The site also offers some employee and employer training guides, including PowerPoint presentations. 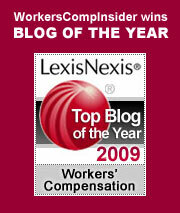 Lousiana Workers Compensation Commission Safety Articles. More than 60 archived articles on various safety topics are available online. A note of caution: workers compensation laws vary state to state, and while many of these materials are general in nature, certain materials may be state-specific. Most U.S. risk managers and health & safety staff are no doubt familiar with the many online prevention resources available at OSHA, but some may be less familiar with resources available from our neighbors to the north. Canada’s Center for Occupational Heath & Safety (CCOHS) is available in English, French, and Spanish – an invaluable resource for employers with a multi-lingual work force. It’s a vast site – one of the most useful sections can be found at OSH Answers, topic-specific health & safety information. The Workers’ Compensation Board of British Coolumbia also provides a wealth of resources at its online Health & Safety Center. The site includes in-depth resources for a variety of specific industries ranging form heavy industries like forestry and petroleum to lighter industries like performing arts and tourism. In addition, the site features free downloadable stickers and hazard alert posters. I’m always partial to interactive *toys* so I found the push, pull, carry and the what does an accident really cost calculators rather intriguing. A recent news story about a 42-year old Bradenton, Florida carpenter who was killed by lightening is sad a reminder that this is the prime season to be on alert for electrical storms. Every year, workers, account for about one third of the total number of people struck by lightening. Lightning strikes are most likely to occur between 2 pm and 6 pm from June to August. While lightning strikes can occur anywhere, this lightning fatality distribution map demonstrates that there is a greater risk in southern and midwestern states. According to the National Lightning Safety Institute, “eighty five percent of lightning victims are children and young men ages 10-35 engaged in recreation or work. Twenty percent of strike victims die and 70% of survivors suffer serious long-term after effects. Outdoor workers (or anyone outdoors, for that matter) should take precautions at the early onset of an electrical storm (pdf). These include seeking appropriate shelter and knowing the steps to take as last resort safety measures when in immediate peril. Workers who spend time outdoors should be trained in prevention. Employers should include lightning safety policies and procedures as part of their overall prevention program, and should review these policies seasonally. Roofers, construction workers, road crews, and farm workers are examples of jobs at risk, but risk managers should be aware of the risks for inside workers and those in vehicles, too…every year, people are injured or killed by lightning traveling through telephone lines. According to the National Weather Service, about 20% to 30% of the strikes result in fatalities. The medical conditions resulting from strikes can be complex and sometimes rather mysterious, differing markedly from voltage shocks. In an article entitled Disability, Not Death, Is the Main Problem With Lightning Injury (pdf), Dr. Mary Ann Cooper discusses some of the medical complexities that can plague those recovering from the aftermath of a strike. Lightning Strike & Electrical Shock Survivors International, Inc. (LS&ESSI) is a nonprofit support group for survivors and their families. National Lightning Safety Institute – an organization that consults and trains in lightning safety and lightning engineering issues.